It is normal to hear names like ‘cobweb spider’ or ‘house spider’ tossed around regularly and mostly out of context. Little do these people know that cobweb spiders and house spiders are actual species and not mere generalizations. Unsurprisingly, Arachnophobia is among the top 10 phobias in the world. In the U.S.A alone, over 30% of the total population has it and definitely not without reason. Even with them being incredibly small creatures, it’s amazing what chaos they can actually cause to humanity. While a spider’s bite might not always kill you, it most probably will itch, swell and become very painful. While many spiders are said to be harmless, there are still some that should really be feared. If there are spiders on your property, it is best if you exterminate them as soon as possible before they can cause you real harm. In order to do this, it is vital that you arm yourself with the necessary knowledge of identifying venomous spiders from those that are not and the various symptoms that their bites can cause. Well, with almost 4000 different types of spiders in the United States alone, spider ID can be quite tough. Start by setting up glue traps around your home to help in identifying the common house spiders that are in your house. The glue traps will capture your critters long before they are dodging across the floor, making them much easier to identify. Here are some of the more common house spiders the Las Vegas area. 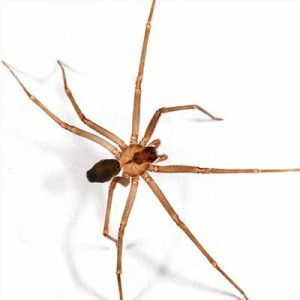 The hobo spider features a brown body that can grow from ¼” to 5/8” in length. It lives in a funnel web. It originated from Europe and has in recent times been linked to some of the most fatal spider bites in U.S.A. In most cases, a hobo spider may bite you when you are in bed where it could be trapped in the beddings. The spider could also be trapped in your clothing just near your skin. Common hiding places include closets, storage rooms, attics and cupboards. When a hobo spider bites you, you will at first feel no pain, however you will feel it harden in the next 30 minutes. The bitten area may feel a bit numb with most victims experiencing dizziness. You will notice some blisters forming after about 15-35 hrs. The spot can also start to slough, but stop after about 24 hours leaving behind a wound that can take several months to heal. While it is usually not considered fatal, the bite from a hobo spider has in in the past caused death. The Brown/Desert Recluse is commonly known as the violin spider or the fiddle-backed spider due to the violin-shape mark on its back. It is also among the very few dangerous spiders found in the U.S. While it is most commonly found in the South-Central States, some are also prevalent in mid-western U.S.A. You could as well use glue to trap the desert recluse due to the fact that they are usually affected by pesticides. The best way to observe recluse spiders is by observing their eyes- they have six eyes that are arranged in pairs. You can find it hidden in dressers, behind pictures, sheds, basement, garage or even cardboard boxes. When a Brown Recluse bites you, you will at first feel no pain, and you can remain unaware of the bite for up to 8 hours. In some instances, the bitten area turns red with some swelling occurring over time and can even take a long time healing. After the healing is done, some visible scars will still remain. While it is very rare for death to ensue from the bite of a brown recluse, it still should be treated as a lethal spider. The female black widow spider are shiny black and are about hail an inch long, minus the legs. They feature red hourglass markings on the underside of their circular abdomen. They have an attractive graceful look for a spider as all their body parts glow at the points. You can distinguish the females with the white streaks and red spots along the abdomen. Males are usually brown/dark grey with yellow or white hourglass shape if any. 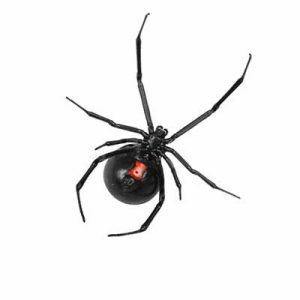 An adult female is usually twice the size of a typical male black widow. The males are harmless with the females being of average to extreme fatality. The black widow spiders usually mate in the spring or summer months. Common habitation grounds include basements, garage, outdoor furniture woodpiles, sheds or stone walls. Most of their bites usually go unnoticed with amount of pain depending largely on the amount of venom introduced and the actual of the body that is bitten. You will experience varying concentration of pain as the venom is carried around the body through the bloodstream. You may experience some swelling with two red puncture spots from the fangs. Usually, the pain starts from the bitten area and works its way to the belly and back to the bitten area causing painful cramps in the process. The fatality rate of this spider’s bite is below 5 percent. Wolf Spiders are common domestic pests that look for habitable shelter during the winter period. They neither spin webs nor are they aggressive – they run away at the slightest of provocations. They will however look for food during the night. It is normal to have the wolf spider mistaken for the desert recluse as the only difference between them is the lack of the violin-shaped pattern on their back of the wolf spider. Bites of Wolf Spiders are characterized by some local pain. Common symptoms include itchiness, nausea, swelling and dizziness.